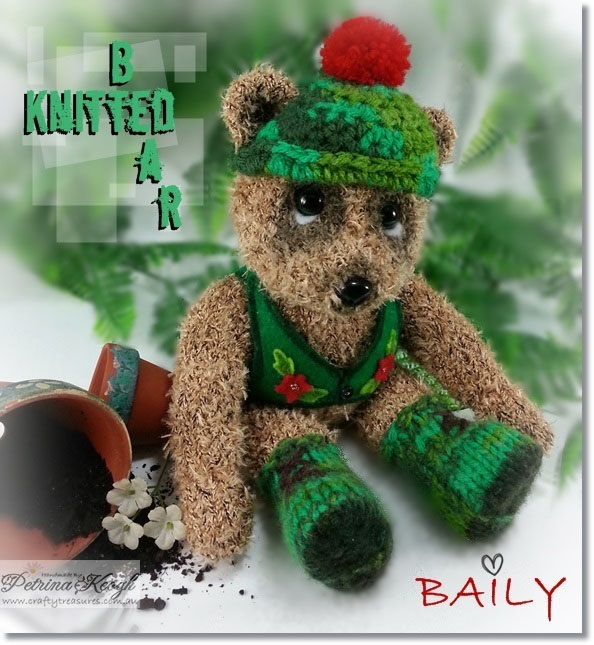 Hi Crafty friends, I have another knitted bear to share with you today. I spotted this yarn in a variety store in my travels and yes you guessed right… it screamed bear at me! 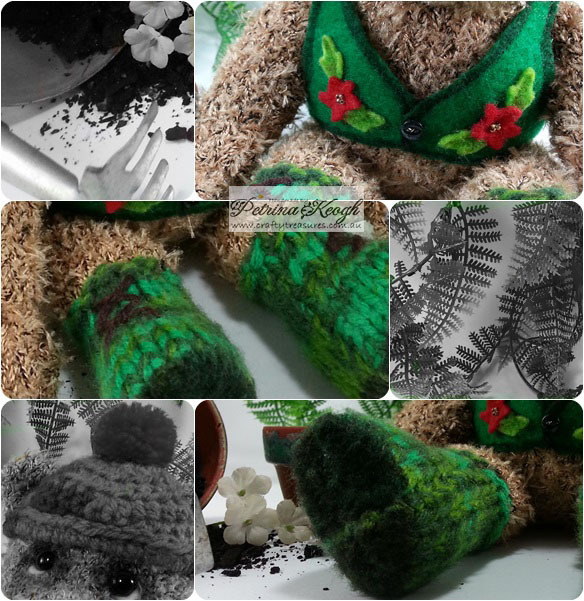 To knit up this fun project I used a pattern designed by Jean Greenhowe from her pattern booklet Jemima Jane and Friends, the same pattern booklet I used for my previous bear projects. Using different yarns and adding special features, each bear has their own unique style. I had basically finished Baily Bear a while ago now and still had to fuss with readjusting his eyes, sewing on a jacket button and beanie to finish him off. I felt this yarn was lacking bulk so I knitted up with two strands of yarn (yarn unknown? Just says knitting yarn on the band… gotta luv it!). He is not jointed and has snap – on style safety eyes and nose. 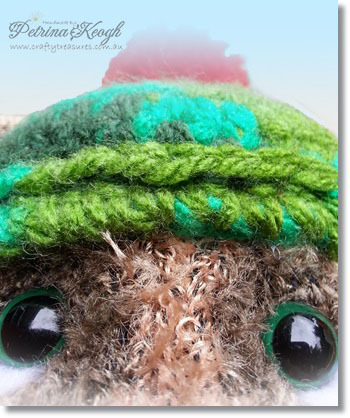 His outer eye area is a lovely green, but my original shots did not pick up the colour, here is Baily’s selfie of his eye colour! Baily measures approx 10.2 (26 cm) in comparison to my previous bears, here are the bears sizes below. This time I made a jacket, beanie and boots with lace ups to match. I knitted a beanie and also made a pom pom to embellish the beanie. For the jacket I made up a template and then cut this out on some green felt. I embellished the jacket with some felt detail cut out with a Marianne Design – Craftables Die Set – Bouquet (CR1210), and embellished this with gold seed beads. For the boots I just changed yarn, but is was knitting up slightly thicker than the original two strands, which was what I wanted for the boots to stand out a little from the legs. I also cut some thick card and inserted into the foot base before stitching him up, to form the base of the boot. The shading around eyes, nose and soles of the boot, were shaded with copic markers. 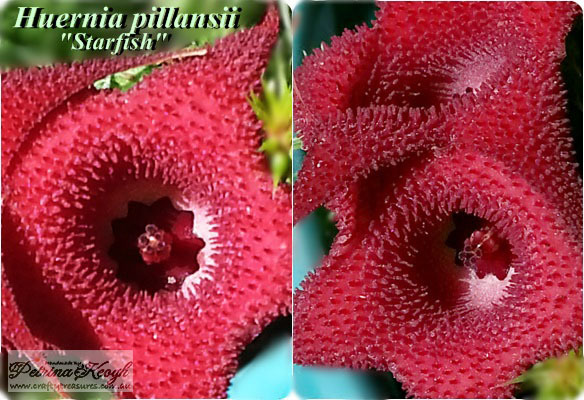 Thought I would share a quick pic of one of my succulents in flower, I thought the centre part look like it had been die cut, who new!